VertaseFLI was engaged to carry out works for the new Anaerobic Digester Plant being constructed in Farleigh Wallop, Hampshire. The site was a formerly used as a dairy for the nearby Manor Farm, then as a storage facility for Portsmouth Estates. The works comprised site wide vegetation and tree clearance, asbestos removal and the demolition of existing buildings to slab, break up of slabs, foundations and obstructions and processing of hard material to 6F2, extensive reduced dig of approximately 14,000m3 of chalk to formation level for Digester tanks; and the construction of a new 3.3m wide tarmac access road and associated Section 278 works to the public highway. Works commenced with the demolition of existing farm buildings, including the removal of large quantities of bonded asbestos sheeting. 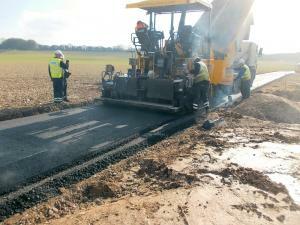 All slabs, foundations and hardstandings were taken up and processed to 6F2 recycled aggregate for reuse on site. A site wide vegetation strip was undertaken to facilitate the reduced level dig to form the platform for the anaerobic digester and storage tanks. 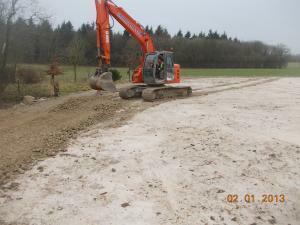 A new access road, 3.3m wide and approximately 1.5km long was formed with Type 804 recycled sub-base following a topsoil strip along the route. Surfacing design was 135mm AC32 dense base/binder course overlain with 45mm of HRA 55/10 wearing course. To undertake the tie in with the existing main public highway, works involved the diversion of existing services, widening the existing farm track entrance to Kennel Farm and constructing new drainage and kerb runs to form the new entrance suitable for HGV traffic to the Anaerobic Digester facility. The carriageway design consisted of excavation to formation levels and a road construction of 120/60/40 basecourse, binder course and wearing surface. To undertake the tie in with the existing main public highway, VertaseFLI applied for and were accepted by Hampshire County Council as an Approved Contractor for the Section 278 works. These 278 works were conducted with a partial lane closure with Chapter 8 temporary road signage and traffic management being implemented for the construction period of 1 week.